Pedestrian and car access through Hall Avenue (off Hall St), just up the road from Pita Pit, across the road from Newtown School, next block down from Wellington Hospital going south. If you look up Hall Street, you’ll see “Hall Avenue” clearly marked with a white signpost. The church venue is located in a back section of Hall Ave. Plenty of free car parks at the church. If you’re catching a bus from the city, get off at the Wellington Hospital bus stop and walk to Hall Street – Hall Avenue is off that. THE MIGHTY UKES are performing Christmas Songs and old classic favourites at Carrara Park Newtown, Wellington on Tuesday 8 December @ 6.30pm – 7.30pm. ALL WELCOME to a free one hour of non-stop sing-along fun-loving hand-clapping evening of your favourite Christmas Songs and classics for the whole family! All voices and instruments are welcome too! Then join us tonight @ 7.00pm-8.30pm, The Office Bar & Cafe, 124 Riddiford Street, Newtown, Wellington. Absolute Beginners & all levels welcome. BYO Ukulele & Koha. Spare ukes available. Come out of the ukulele closet and join The Mighty Ukes and the Ukulele Revolution. Relax and strum along with us for a fun ukulele jam session. All songs provided on the large wall screen – just bring you and uke. We usually warm up with some 3 chord popular folk/culture songs to encourage our beginners to join in, then we step-up gear as the night ticks on. We’re also dusting off well-loved classic hits and bringing them to life with the Mighty Uke. Leonard Cohen classics like “Dance Me to the End of Love” Johnny Cash “Ring of Fire” Del Shannon “Runaway” Roy Orbison “Blue Bayou” and many many more of your favourites! * Attend our Monthly Beginners Ukulele workshops. 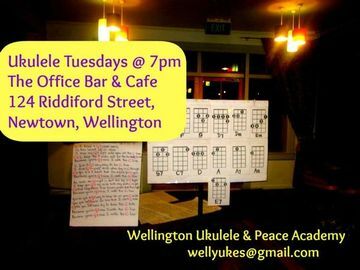 * Join our friendly Ukulele Tuesday Meetup group @7pm-8.30pm every week for regular fun practice and meet other Ukulele Lovers. * Receive our updated Ukulele DropBox which has over 400+ song sheets with uke chords. It also contains Common Chord Charts, Ukulele Online Tuning and video links. This will help you practice at home between our Weekly Tuesday Meetup sessions.